An activist’s role in ActionNet is to show up to rallies and events, meet with legislators in their areas, and work directly for change. People become activists when they choose to do more than write letters or make phone calls. Activists address issues in a direct way, by meeting with individuals in power, such as government officials at any level. Activists work on issues as a group or join with other groups to address larger issues as part of a coalition. The regional contacts are responsible for maintaining local groups, ensuring information is distributed to their local groups, and working with activists and advocates in their areas. Individuals in this position will be required to come to Madison once a month to receive training in a number of grassroots capacities, including group development, systems advocacy, and leadership training. This is a great chance to be a leader in your area! Unsure about whether or not advocacy is for you? Become a partner and learn about the issues facing the disability community as a whole. From your neighborhood all the way to the White House people with disabilities face issues on many levels. With more information, you may find something interesting to voice your opinion about. It is also important to share information with people outside the network such as friends, family, or coworkers. Anyone and everyone in the network is a partner. Advocates are the voice of ActionNet. Advocates let public officials, business owners, as well as other people with disabilities know what issues the community feels are important. Only by working as a community can we find the strength to make real change. People become advocates when they voice their opinions to the public, and those in power by making phone calls or writing letters. Learn more about our AT services. 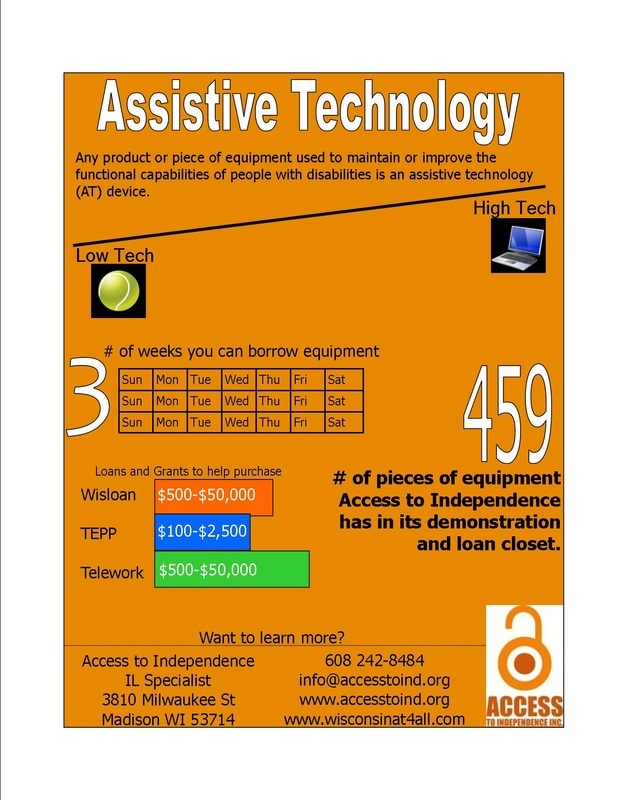 Wisloan is a program that help people with disabilities pay for equipment. The independent living (IL) philosophy is based on the idea that people have the right to make their own choices, manage their own affairs, and live as independently as they choose. Access helps people develop the tools and skills to make informed choices for themselves, and works to increase the choices available to people with disabilities. The full inclusion of all people with disabilities, in all aspects of community life. Promote the rights of people with disabilities to take control of their lives. Value and utilize the life experiences of all people with disabilities. Value diversity and cultural differences and strive to provide services in a culturally competent manner. Promote the presence and participation of people with disabilities in all aspects of community life. 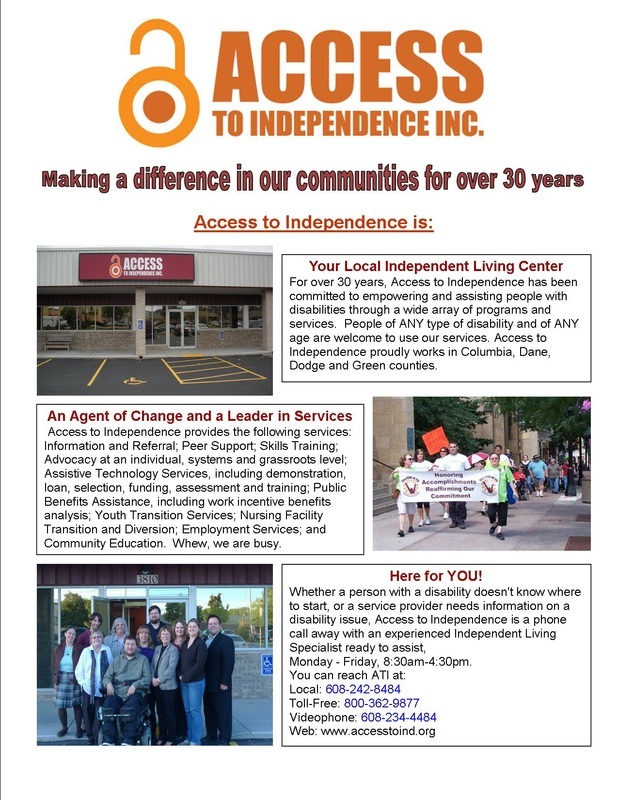 Raise money for Access to Independence - Madison (Madison WI)just by searching the web and shopping online! Peer Power is a unique peer-based program designed to support high school students with all types of disabilities to plan for their lives after high school. Peer Power is unique in that the program is driven by the students. Peer power members help run and shape their group by talking about their interests and what they need to help them fulfill their goals. They plan for their future and what they want to do when they transition from high school into the adult world. We are looking for people to serve on the board of directors for Access to Independence. If you are interested fill out the application and return it to the nomination committee.